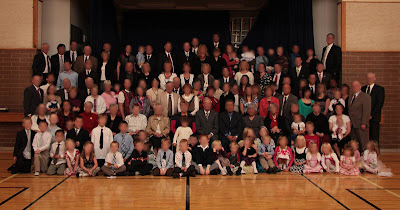 I had the opportunity to photograph a large group (128 people) a few weeks ago. What I was faced with - other then the number of people to be photographed - was how to arrange them and light them evenly with two small off camera strobes. The room we were going to take the photo was a small gym with a stage on one side. The lights in the gym were a combination of large fluorescent banks and tungsten pot lights. Fluorescent bulbs cast a greenish hue in daylight balanced images while tungsten lights cast an orange hue. To see what I’m talking about set your digital camera to the “sunny day” setting and take a picture in a room that is lit with regular light bulbs and see what happens. To address this I first turned off the fluorescent lights to so I would only have to contend with one type of colour cast (tungsten), and to bring the ambient light level down so I could easily over power it with my small lights. I then set up a single row of chairs, 3 feet in front of the stage. Once I had addressed the ambient light and the area where I was going to position the group I focused on how to light the area. I shoot with a Canon 40D and have several small strobes that I use, but rarely on my camera. I use radio triggers to fire the flashes. I have a transmitter on my camera which sends a signal to the receiver which in turn fires the flash. In this situation I set up two of my lights on stands that extend to approximately 10 feet high. In this situation I set them to a height of about 8 feet and pointed the flashes towards the ceiling and away from the group. I did this because as I was looking around the gym I noticed that the ceiling sloped at an approximate 45 degree angle around the perimeter of the room. 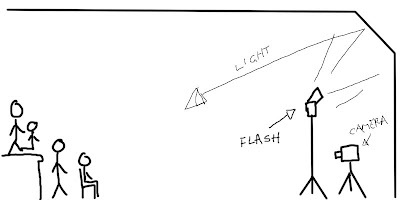 If I pointed my lights at the angled portion of the ceiling then the light would reflect back towards the group, softening the light and creating a larger light source (see diagram A). 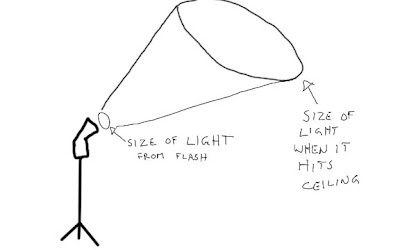 The light source is lager because the light from the flashes would have to travel the 10-15 feet to reach to the ceiling and when it reached the angled portion would have spread out to a larger diameter and would reflect back towards the group (see diagram B). 1) I wanted to shoot at a higher shutter speed at a lower ISO (to reduce motion blur and high ISO noise). If I would have shot with the available light I would have had to crank up my ISO to get a nice fast shutter speed to freeze any motion which would have introduced too much noise (grain) into the image. 2) I wanted more control over the light and which direction it was going to hit the subjects. The fluorescents were directly above the subjects and would have cast unflattering shadows under their eyes. Now that I had the lighting arranged I was ready for when the large group came in. The group consisted of individuals ranging from infants to the elderly. I naturally had the older members of the group sit on the arranged chairs and had most of the children sitting on the floor. I had the other members stand behind the chairs in two staggered rows, then another row kneeling on the stage and then the last row standing on the stage. This arrangement created a layered/tiered effect in the group and made it possible for (nearly) everyone to be seen. This is by far the larges group I have photographed and I am pleased with how it turned out. Some things I’m going to take from this process are that my Canon EFS 17-85mm is a bit soft around the edges which resulted in the members on the sides of the group appeared a bit out of focus. Now I am contemplating purchasing a 17-40mm F4 L lens from Canon. This lens is a full frame lens and would effectively become roughly a 24-56mm on my crop sensor body. The thing with crop sensor bodies I both like and dislike at times is that they take the center portion of the field of view (which typically is the sharpest portion) of a full frame lens. It also makes your telephoto lenses that much longer. The down size is that a wide angle lens isn’t able to see as much of a scene because it crops out the edges.